Hey, everyone! I'm Robert McCall, and I'm the Dynamic Discs Team Manager. Each week, I like to share a quick tip I've learned over the years. Let's start with a real-life situation you've probably encountered: You're standing over a 45' putt on hole 18. If you make it, you shoot your personal best/win your league/beat your friend for that round. You line up the putt, thinking, "Just give it a chance." In your attempt to give it a chance, you sail over the top of the basket and leave yourself a 25' comeback putt. Winning outright is now out of the equation and that 25' putt feels more like the 45' putt you just had. 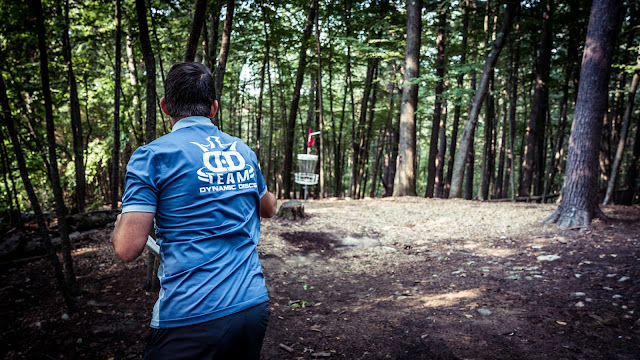 Putting is probably the most mentally taxing and potentially frustrating part of disc golf. There's no worse feeling than throwing a perfect drive and missing a short putt while your cardmate throws a bad drive with a good upshot and achieves the same score. The old adage, "drive for show, putt for dough" may be overused at this point, but it's absolutely true: strokes and wins are gained and lost on the putting green. Because of putting's great importance to your score, I'm going to give you a really simple piece of advice: if you're not going to commit to making your putt, don't try to make it at all. Take your putter, and toss it under the basket. While it's not the exciting, crowd-pleasing play, laying up accomplishes two things: 1) You limit your potential to take a big number on the hole because of missed putts, and 2) you avoid the mental stress of three- or four-putting. When I'm playing practice rounds for a tournament and keeping score, I practice laying up as well. It's a lot more fun to run putts from everywhere, but you're creating bad habits for the future. As silly as it feels to lay up during practice, you'd rather have a few repetitions there than being forced to try it for the first time when the pressure is on. Putting is generally a probability game: we run the putts that we think we can make with decent confidence that we'll be able to make the comeback putt if we miss. That range is usually around 30-50 feet for most people, but we often see a 30' putt with a drop-off behind and run it without fear of the consequence behind the basket. The slope surrounding the green and obstacles should all be considered when deciding whether to run a putt or to layup. Even if you're facing only a 20' putt with trouble behind, if you don't think you're going to make it, toss your putter intentionally under the basket and save the strokes you might have gained by missing. When you're putting, commit 100% to your play whether trying to make it or laying up. You'll be happy that you did when you save strokes and improve your scores. What's your putting strategy? I'd love to hear feedback on what has worked for you or if this strategy helps your game. You can reach out to me via my social media links below or by submitting a question to the Disc Golf Answer Man podcast. See you next week! One of the most challenging things to do in a practice round, go for it vs laying up.